Gearing up for Organic Chemistry this Fall semester is a smart and efficient way for reaching and maintaining a great grade in this class. Most students find the pace of this class very accelerated compared to other courses. 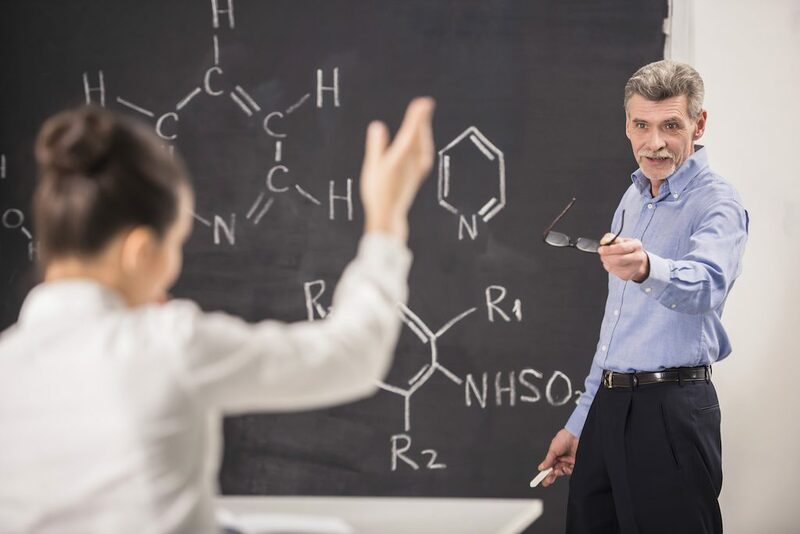 This is because while there is a lot of information to learn, it also builds on previous concepts from general chemistry, a course most students want to forget! One of the concepts you will need to have mastered before you begin the class is Hybridized Orbital Theory. 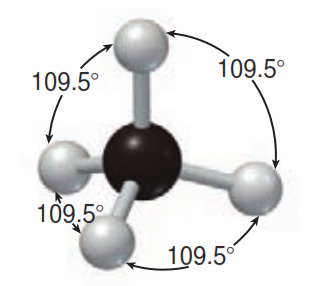 Lets look at carbon, the atom this class is about. Recall that it has atomic number 6, which means it has 6 electrons. Remember that the rows, or periods, of the periodic table reflect the outer electron orbital. 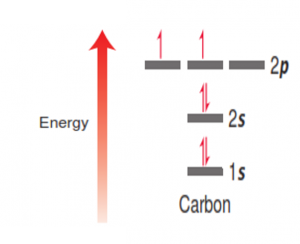 In the second period, carbon has 4 electrons in its outer orbital. These are the electrons that are available for bonding. The carbon atom wants to eventually achieve 8 electrons to fulfill the Octet Rule, so it needs to make 4 covalent bonds. 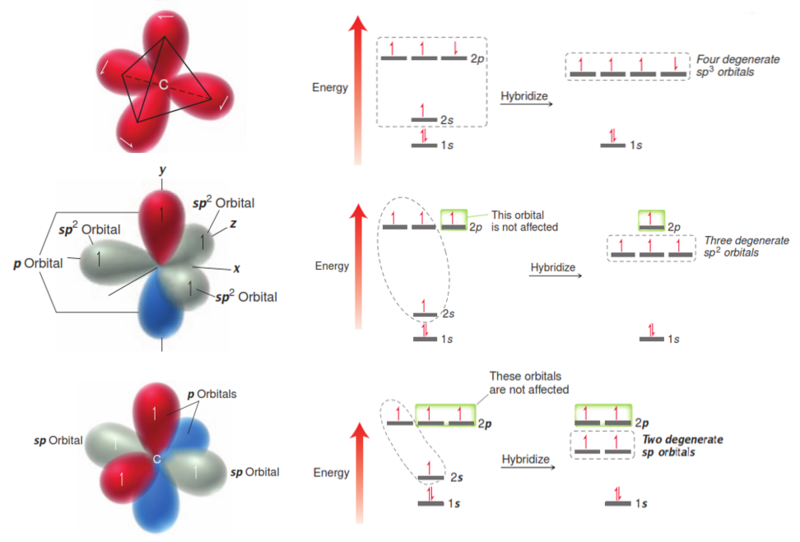 Below is how the electrons are filled in their orbitals. 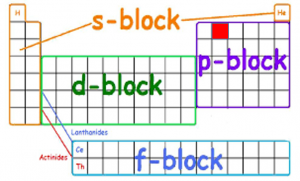 Recall that the columns, or groups, of the periodic table reflect the type of electron orbitals present in the atom. 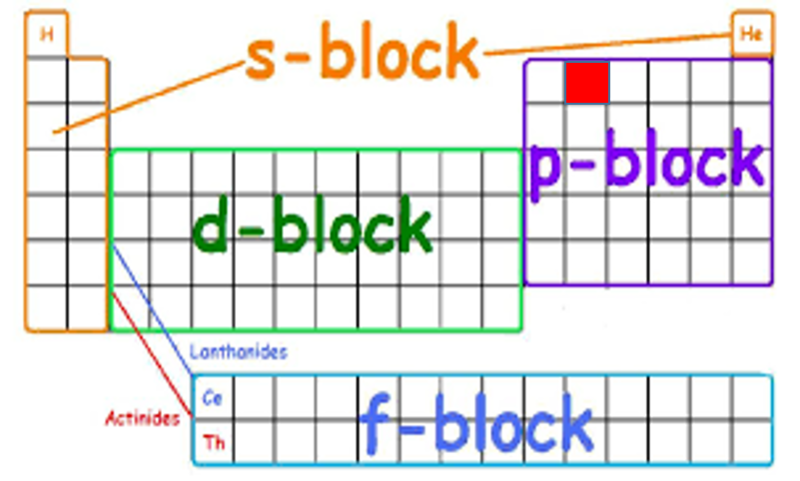 The red block is the location of carbon, which indicates that carbon has 2 s-orbital and 2 p-orbital electrons. But it we consider the molecular shape of methane (CH4), we will observe it as tetrahedral, where all 4 C-H bonds appear to be equal, so how do the electron energies become equal? sp3 – which has 4 single (sigma) bonds. The molecular geometry is tetrahedral. sp2 – which has 3 single (sigma) bonds and 1 double (1 pi) bond. The molecular geometry is trigonal planar. sp – which has 2 single (sigma) bonds and 1 triple (2 pi) bonds. The molecular geometry is linear. With a good study plan and help from StudyOrgo, you’ll have no trouble passing your organic chemistry quizzes and exams this semester. Sign up today for more comprehensive and clear-cut explanations on all of your organic chemistry topics today! One of the most challenging concepts in conjugated system reactions is molecular orbital interactions, or MO theory. 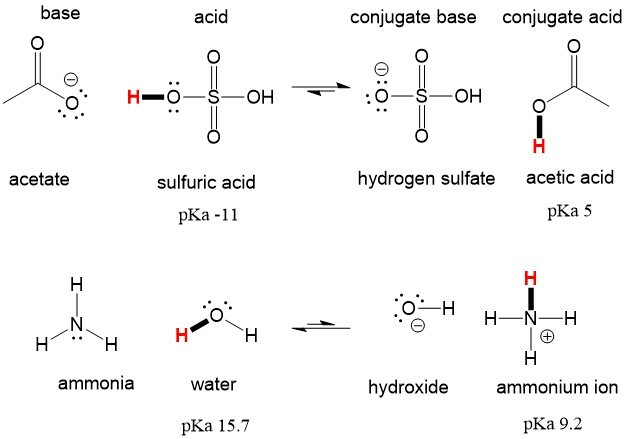 The basics to this principle can be hard to grasp, but will be very informative in predicting the correct reaction conditions and outcome of the reaction if you understand them, which will give you a major advantage on future quizzes and exams. We at StudyOrgo have devised a simple explanation of the basics to MO theory to help you with your study preparations. The basic concept of MO theory is to describe the alternating patterns of orbitals that exist in pi bond systems. We describe the orientation of each half of the dumbbell orbital centered around an atom as being bold or open. Remember, there are bonding and antibonding orbitals. Essentially, orbitals with lower numbers of nodes (switches in the orientation of the dumbbell orbital which we show with the dashed line) behave more like bonding orbitals while orbitals with higher numbers of nodes behave like anti-bonding orbitals. To determine what orbitals are occupied on your molecule, simply count how many pi bonds you have in your conjugated system. Below is an example of butadiene. It has 4 pi electrons, so we fill the lowest molecular orbitals first, two in each orbital. Therefore, the highest occupied molecular orbital, or HOMO, in butadiene is #2. 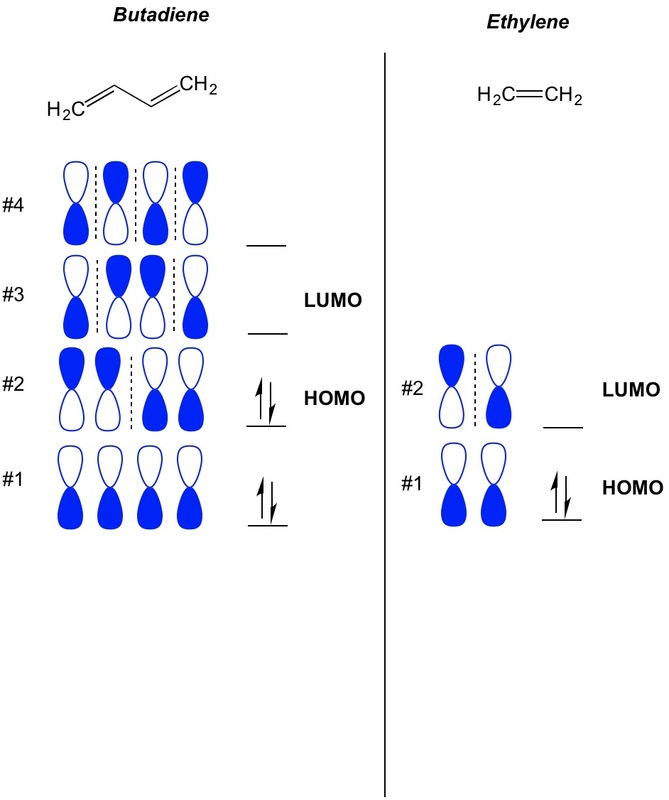 As a result, the lowest unoccupied molecular obital, or LUMO, in butadiene is #3. We can extend this to ethylene and see that with 2 pi electrons, molecular orbital #1 is the HOMO and molecular orbital #2 is the LUMO. Remember that cycloaddition reactions describe the formation of new C-C sigma bonds through rearrangement of the pi electrons in a conjugated system. Therefore, we need to use the molecular orbitals of the pi electrons to drive the reaction. Let’s take the reaction of butadiene with ethylene, the most simplistic Diels Alder reaction (4+2 cycloaddition). 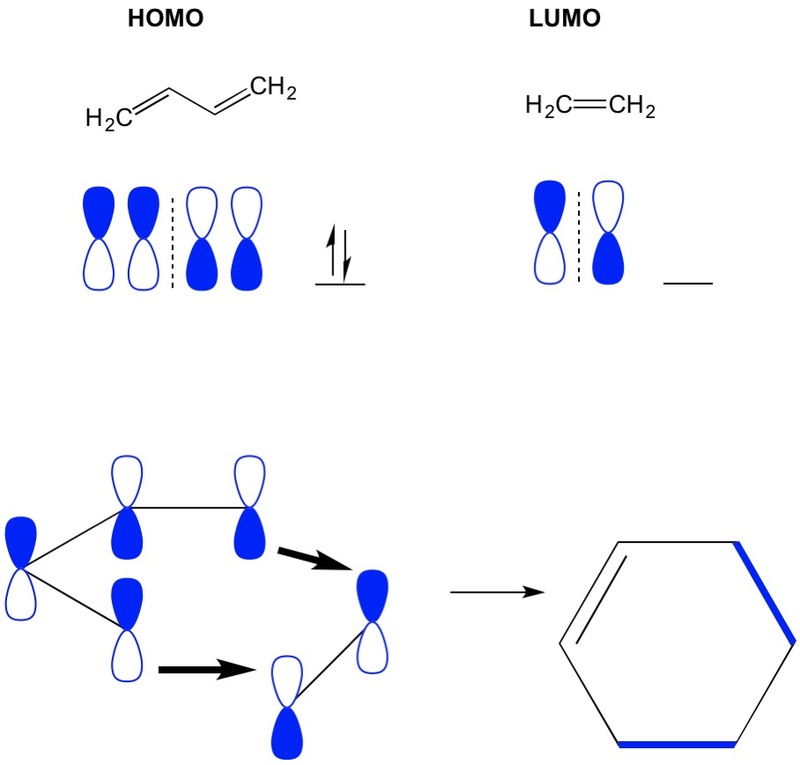 We start with the most conjugated molecule, butadiene and examine its HOMO. Then we look at the least conjugated molecule, ethylene and examine its LUMO. Why? 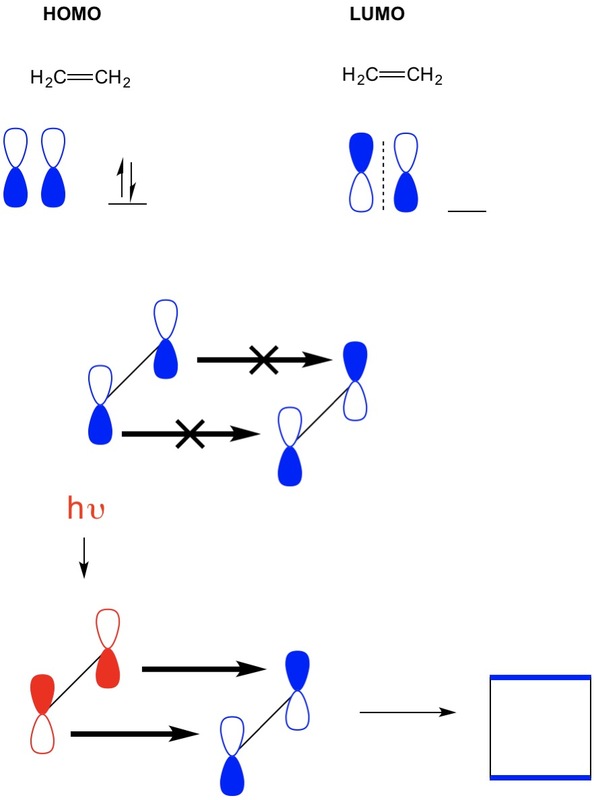 We need the electrons from a HOMO to flow from one molecule to another, so we have to use the LUMO orbital that is not occupied for this process. We see that nodes of the HOMO and LUMO align; that is the open and closed halves of the dumbbells align. This leads to a forward reaction and formation of the product, cyclohexene. However, in another example where we have a (2+2 cycloaddition), we see the HOMO and LUMO of ethylene do not align thus forbidding the reaction. However, we have the ability to excite electrons from the HOMO to a higher orbital using light (hv) or heat, thus changing the HOMO. We review this concept in detail in a previous article. When we do this, the HOMO of excited ethylene and LUMO of ground-state ethylene align and the reaction produces cyclobutane. We hope this description has helped clarify this concepts of MO theory. This is an example of the clear and simple expatiations we have prepared for over 175 reactions commonly seen in Orgo1 and Orgo2 courses. Sign up today for your study preparation needs!